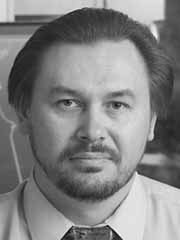 Vladimir A. Rakov has been a leading lightning researcher for more than 20 years. He has been involved in many experimental and theoretical studies concerned with the physics of the lightning discharge and its interaction with various systems. Rakov’s accomplishments include developing a theory on the behavior of lightning once it has hit the ground and determining the basic modes of lightning charge transfer to the ground. One of Rakov’s more applied projects involves lightning at small, unstaffed airports, where it is a major hazard because it knocks out runway lights. If a pilot approaches the runway and can’t turn on the lights by remote control, “what happens next depends on how much fuel the pilot has left,” Rakov says. Through a project funded by the Florida Department of Transportation, Rakov and his colleagues triggered lightning to a model runway, built to Federal Aviation Administration standards, to better understand how lightning affects runway lighting systems. “When we understand the mechanism, we will try to design a better lightning protection system,” Rakov says. The project is one of several aimed at saving lives and reducing property damage from lightning, which kills about 100 people annually (more than tornadoes and hurricanes combined) in the United States and is involved in 5 percent of all US residential property damage insurance claims. Rakov’s work is recognized throughout the world. He is the author or co-author of more than 250 publications on lightning, including the 850-page monograph, Lightning: Physics and Effects. The chair or a member of many international committees in his field, Rakov has served as organizer of several lightning sessions per year at international conferences. He also gives about three invited talks per year around the world. Rakov has received numerous awards, including one from the American Society for Engineering Education, as well as more than $3.5 million in external funding for his research.